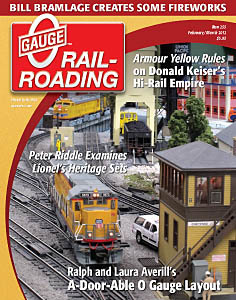 Armour Yellow motive power reigns supreme on this well done Hi-Rail layout. Bill Bramlage builds a fireworks display! and the Canadian Pacific D10 4-6-0 steamer from 3rd rail. OGR Backshop Foreman Jim Barrett tells you everything you always wanted to know about transformer phasing, amp draw and layout wiring.